I swear I posted my last attempt at this sometime ago, but can't seem to find it. So I'm making a new thread for this. Anyway, for sometime now, I've been trying to make a custom cover set for all my zillions of Disney DVD's (and now few Blu Ray's) that make up my ever growing Disney Media Library. If you are like me, then your collection must be getting rather large, and with sticking with just the original studio art work (which sometimes I don't think really does a few of the films much justice) then your shelves must be busting at the seems. Which is why I started getting into custom DVD covers in the first place, to save space, but still make my DVD shelves look good. Anyway, when I am done, I hope to have sets for the Disney Animated Classics, the Pixar films, the shorts, the Disney Afternoon/ tv animation, what I am calling The Disney Showcase (which is all the non-DAC films), Disney Nature and maybe the live action films as well as themed sets like "Platinum Line," or "Diamond Line," "Princess Collection," "Disney Villains Collection," or whatever else I may come up with. When all is said and done, I hope to have a very diverse collection of covers that would make any Disney fan happy. Anyway, what I have been working on this last week is the rough draft of what is the first in this collection. It's for the DAC set and I'm really excited about it. I have posted it over at the custom DVD covers sites I visit already for their feed back, but, a lot of them are not Disney fans and I want that perspective put into this. You need to understand this is VERY much a rough draft only posted and shared to get some basic ideas about the basic direction I'm going with this. It is not done yet and I know that some parts that are on it need to be polished up still, but, I wanted to make sure I'm in the right direction with it. I'm going to add the original posters on the back and maybe a quote from Walt on each cover. I'm not catering to the Disney Blu Ray crowd right now, but that said, will either add both the DVD and Blu Ray logos on the back or neither of them so you can use this set for either or both. I posted a little while ago that I needed a better his res picture of the magic mirror. This is why. What I found is as good as it will get from Google, so anyone with a better picture, I would be grateful. 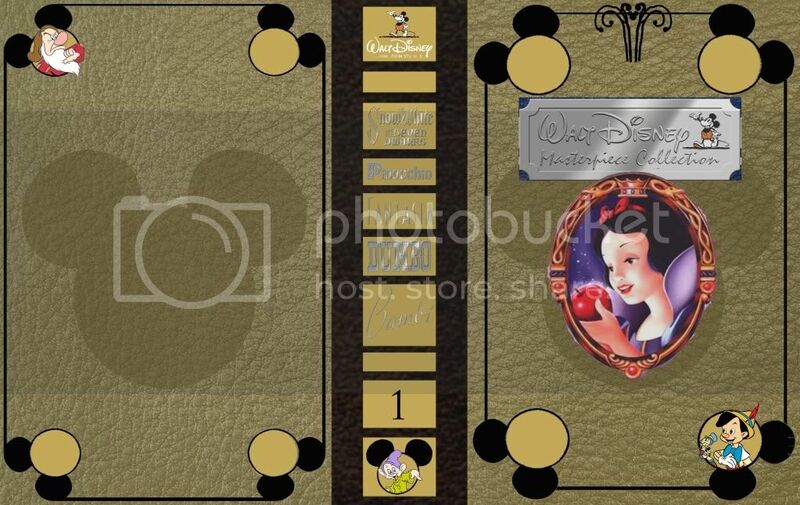 I would like to keep the magic mirror for this set for each new cover and add "Disney Dust" to each cover as well. On many of my earlier version of this, it was very character driven. I wanted to get back to hat, but make it look good. There would be a character on each corner. I only added one on the front a back to give an idea what it would be like. I may or may not keep black for the spine, but each collection (Pixar, DAC, Shorts) will each have a different cover hat ties them all together. So I'm trying to keep that in mind when picking a spin color to make sure I do one that could work with all the themed colors of each set. I will definably polish up and make more of the graphic on the top of the front cover. I got the idea from the "Alice in Wonderland" box set that the Disney Movie Club sells. It is just there to show the direction I want to go with it. So, I think that explains a lot for now. What do Disney fans feel about how this cover is coming along? I want it to feel like something you'd find at Sleeping Beauty Castle at Disneyland if there was a bookshelf of story books there, if that makes sense? I hope this is going in the right direction and hope to post more final version later. Thanks! I swear I posted my last attempt at this sometime ago, but can't seem to find it. That's because you spelled "custom" with an "e". This is a kind of series that I've been working on... I like uniformity, and Disney is not a good company to be a fan of when one likes uniformity. It's ok though, that cover wasn't as much mine anyway, so I'm still ok dedicating a different post to this after thinking about it. Thanks! Like I said, I'm not done yet, but I hope I'm in the right direction. I really like your covers for individual films. My aim if more for grouping the films together, but if I was to keep them as separate covers, I' like yours. Do you have spines and/ or backs for them yet? I'd love to see them! I agree by the way, and just another reason why I'm doing this, Disney is horrid when it comes to making tehir films uniform on VHS, DVD or Blu Ray! love those covers... they all look awesome! i got some 6 space cases and put together covers. i used original posters found on google and reduced their size to fit 6 on the front. i then found back covers and did the same, then used images from disney clipart for the spine. i found it hard to read the titles when all bunched up, so the images are easier for me. they dont look flash, but better than nothing. I did do a mock-up of the rest of the Rapunzel cover. Obviously I had to make up bonus features and quotes and whatnot. After nitpicking through that wonderful Rapunzel cover, the only thing I could find is the Dolby Digital Plus logo thats only ever been used for HD-DVDs. Glad you like it otherwise! Oh wow, that looks AMAZING! If I wasn't so stuck on grouping them together, I'd so want to use your covers! SWillie, I love your covers. Especially the Rapunzel and Princess and the Frog ones. They are amazing, and I would definitely buy them! Wow SWillie your custom covers are amazing, and blows the official ones out of the water. Last edited by kenai3000 on Tue Nov 02, 2010 5:30 pm, edited 1 time in total. Yes, you should make more, you have done a great job! I love that Princess and the Frog cover. Nice work! I agree. The cover for The Princess and the Frog looks awesome. Ummmm, Disney needs to hire you right now!! Those covers are beautiful! More grown up covers!